Freedom! After spending about two months at home healing, I couldn’t wait to take a road trip, so I took two. My ankle is still not completely healed, I am able to walk ~ slowly and was prescribed to ride a bike by my doctor, Dr. Kadakia (aka Dr Awesome!) My boyfriend and I decided to take two weekend trips and explore areas of Michigan that I have never been before. 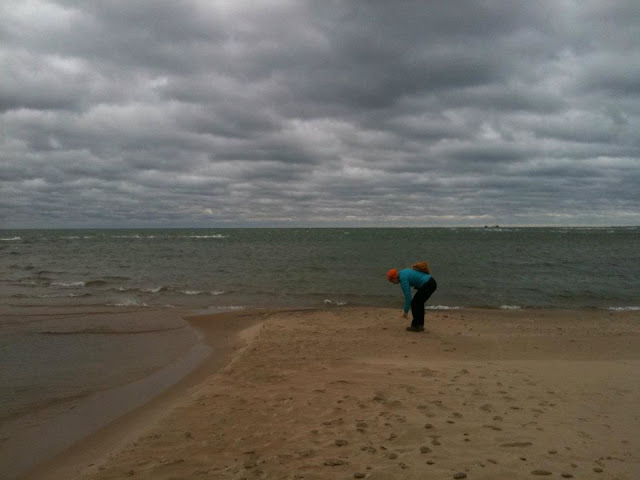 Our first trip was an overnighter in Tawas which is on the shore of Lake Huron. I have spent a lot of time up north on the west side of the state, but never the east side. Tawas was a pleasant surprise. We were car camping at the Tawas State Park because of my inability to backpack, but there is nothing like sleeping outside! The weather was blustery with 50 mph winds and overcast sky, but we didn’t care. The park has a beautiful beach with a lighthouse on it and lucky for us, they were giving night tours to the top of it that weekend. They only offer this once a year, it was pretty cool to see the lights from Port Huron, which is a good three hours away, from the top. The next day we stopped at the local gear shop, Nordic Sports to poke around and met Gary, the owner who started a non-profit group to maintain winter X-country and snowshoe trails in the Huron Forest. He gave us some great maps full of hiking and winter trails and told us about a hidden treasure in that area that I am going to keep to myself (Sorry!) Regrettably, we didn’t have time to hike any of the trails, but plan on going back this winter, it was that enticing. We spent the following weekend on Lake Michigan and Lake Superior. We spent a night on Mackinac Island, a place I have always wanted to go, but had never been. It was the last weekend they were open for the season. The island is beautiful and is famous for having the historic Grand Hotel and for being automobile free; bikes are the transportation of choice. 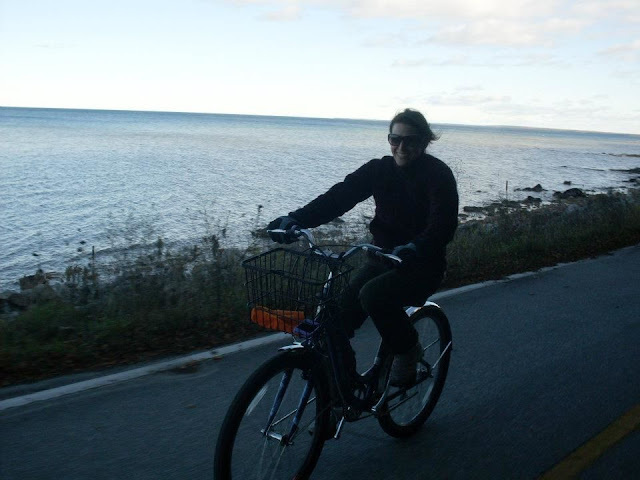 We rented bikes on the island and spent the afternoon pedaling along the coast, which was magnificent. Seriously what the doctor ordered! We had perfect fall weather and both agreed the ride was the highlight of the trip. After a night on the island we drove up to Tahquamenon Falls. Again we car camped, but luckily we were virtually the only people there, so it felt more like “real” camping than Tawas did. We spent the two days there light hiking to see the upper and lower falls. The falls have an orange tinge as they spill over the rocks; the color is a result of tannins leached from a cedar swamp that feeds into the river. During peak season there is a brewery at the upper falls, but they were closed for the season when we were there. We also drove over to Whitefish Bay on Lake Superior for my first glimpse of Gitchi Gumi. Whitefish Bay is where the Edmund Fitzgerald was shipwrecked and they have a Shipwreck museum there, but we were too cheap to pay the $18 per person admission fee. The beach was gorgeous; white sand, a splattering of rocks and the deep blue of largest fresh water lake in the world = awesome. It is trips like this that make me appreciate the state I live in. Seems a shame I am not more into water sports though. Oh well, so many outdoor interests, so little time! Petzl Helmet Giveaway: Comment to Win! I never used to wear a helmet rock climbing. I usually climb at the Red River Gorge, and many people that climb there don’t. My thought was if there was if there was a lot of overhang on the route, or when I start leading trad, then I would. But then something happened that changed my mind. I took a trip out to Lander WY to climb at Wild Iris and The Sinks Canyon. It was my first time climbing out there and the varieties of rock amazed me. We were at Wild Iris, warming up on a 5.7. Warming up, I may not be the most skilled climber, but I have onsited, on lead, 5.9s and flashed 5.10s on top-rope outside. This was supposed to get my blood flowing. Well, it certainly did that. I took an unexpected fall at the second bolt. It scared the hell out of me, my belayer, and my kids, who were watching. Luckily I was fine, scraped my arms and legs up a bit (and it doesn’t appear that my kids are scarred for life.) Yet, it could’ve been much worse. After that, I picked up a helmet I had with me all along (for my kids) and proceeded to send, on lead, the 5.8 route next to the 5.7 just fine. You just don’t know. I mean seriously, I displaced my ankle in 5 places coming off of a V1 bouldering problem in the gym. I didn’t slip, or fall. I jumped down, landed just fine, but my ankle buckled from underneath me. Things happen, why take the risk? Taking my kids on their first road trip out West may have left me broke, but it was so worth it. Not only was it their first time west, but also their first time outdoor climbing and first time dirtbagging it. We took I-90 out to Lander Wyoming and hit all of the attractions like Corn Palace, Mount Rushmore, Badlands, Wall Drug then rounded it out with a (too short of a stint) through the Tetons and Yellowstone. Being a single mom who doesn’t make a whole lot of money, I knew deciding to take them on a trip like that would be a stretch. My plan? Do it as cheaply as possible! Which meant choices like: cereal with milk on the back of the tailgate in the mornings in parking lots for breakfast. The first morning of this my 12 year old showed her disdain by rolling her eyes and scrunching up her nose, “Really mom?” Yes, really, my little diva! We also lived on Nutella, PBJ, and other simple foods. Other dirtbagging tricks were on the way out sleeping in my truck. My son was short enough to lie down in the backseat and my daughter and I reclined the front seats. It was really pretty comfortable. When we arrived to our destination, the International Climber’s Festival, we opted for the free camping, took $2 showers at NOLS, and I volunteered to offset the cost of my admission. By the middle of the trip they pretty much embraced our hippie ways. One of the funniest things was when we stopped at a truck stop in Rapid City for a shower. My daughter was like, we can’t stop here, it is full of “burly men!” I told her to trust me, it was perfectly legit. My days from following the Dead taught me many tricks of living on the road. She calmed down when she saw it was in fact clean and not at all sketch. This trip reminded me of how much fun I used to have in the summers living like a hippie, I fully embraced it and had a great time, my attitude wore off on them and they started to relax and have fun with it too. Don’t miss my guest post on PembaServes detailing the International Climber’s Festival. Ahhhh. Yes, indubitably that was a sigh. I just spent 5 glorious days on the Island of Puerto Rico where I pretty much didn’t have to do anything. It was wonderful. I accompanied a friend of mine, who won an all-expense paid trip through his job with Best Buy; and here is a shout-out to you, you are one of my new favorite retailers! I cannot tell you how heavenly it was to be awake and lying in front of the ocean by 8am, only to be interrupted to eat breakfast at 11am, and not feel the least bit guilty! I mean, seriously, if I attempt to go to the lake to catch some rays while at home, my mind is always reminding me of the millions of things I should be doing instead. Or I am with my kids and want to be making fun memories for them instead of indulging myself. The highlight of the trip was an excursion we took to the bio-luminescent bay in Vieques, Puerto Rico. Biobay is one of the few places on earth where the water actually glows green when you touch it. We took a guided tour at night and paddling a kayak into a protected cove, through a canopy of trees, in the pitch-black night. When you get far enough in, if you place your hand under water and swish it around, it emits a green glowing color. If you lift up a handful, your hand is sparkling with green diamonds. It was so amazing. The quiet darkness, the serene water, the glow of the ocean, was truly magical. Our guide explained the why the water does that but, I can’t remember exactly why, and honestly, I don’t care. I am happy to think of it as a magical wonder of the world. “Caption that Photo!” contest winners! Contest, savings & a quick catch up on gossip!